Several years back, I gave up freelancing to "go exclusive" with a single client. Between 1999 and 2003, we quadrupled the size of his customer files, along with his revenue and profits. In 2004, I ended that exclusive arrangement and started talking with my old clients again — and all I heard was "Arthur Johnson" this and "Arthur Johnson" that. Seems in my absence from the freelance scene, a new guy had showed up … created a gaggle of hot new controls for Boardroom, Agora, Phillips and others … and had joined the elite ranks of our industry's "A" level writers. I've mentioned Arthur several times before in THE TOTAL PACKAGE — particularly, his red-hot "Had Enough?" control for Dr. William Campbell Douglass. It's a textbook case on how to electrify a maturing market and get a blockbuster control when everyone else is failing. Recently, I had the opportunity to ask Arthur about the secrets of his stellar success. His answers will be of tremendous value to anyone who writes sales copy or works with writers. ARTHUR: Hey, Clayton, good to talk to you. CLAYTON: I've been hearing your name all over the place. I hope it's in a good context. CLAYTON: Oh, absolutely, yes. The people at Boardroom and Agora just sing your praises. From what I hear, you and I are as unalike as night and day. I'm a high school dropout. You graduated Swarthmore with highest honors and have a graduate degree in English from Oxford. ARTHUR: That is correct. Guilty as charged. CLAYTON: (Laughter) And you were going to be a poet. That was what I wanted to be when I was in school. Unfortunately, poets are not remunerated the way a lot of businessmen are. I sort of had this fantasy that I would be this — it was sort of, I guess, the academic equivalent of wanting to be a rock star. CLAYTON: Sure. I heard many in your family were involved in religion. Yes. My grandfather, who I dearly love and I was very close to, was the Chairman of the Board of Christian Education at the Presbyterian Church in the United States. And he actually developed the Sunday school curriculum that a lot of kids who went to Sunday school in the ’50s and ’60s grew up with, among other things. He was a great guy. I learned a whole lot from him about people. CLAYTON: My dad was a Methodist minister, so I grew up in that. CLAYTON: Yes, I am, which explains my notoriously bad behavior. (Laughter) That's what they say, yeah. CLAYTON: We had to move every three years the whole time I was a kid. Well, you learn to make friends. CLAYTON: Yes you do. So how did you find a job at the Franklin Mint? It kind of found me. When I was finishing up at Oxford — going to Oxford was just sort of like a vacation from having to make any career decisions. It was terrific. And towards the end of my time at Oxford, I suddenly realized I'm gonna have this degree, and I either have to go into academia or find something else to do, because if I study any more I'm gonna be unemployable. So I kind of asked around with my friends, what do English majors do if they don't want to go into academia? And I very much did not want to go into academia, because I discovered the higher up you get, the more politics there are; and politics are something that has never interested me in the slightest. The answer I kept on getting was "investment banker." And Morgan Guaranty was actually recruiting at Oxford at the time. When I came back to the United States, I was all set to go to New York and do another interview with them, and hopefully get started as an investment banker, and fate kind of stepped in. I wandered into a bar in Philadelphia under strange circumstances, a bar I've never been to before or since, and I ran into an old friend from high school who was a sculptor at the Franklin Mint. I hadn't seen her in years, and she asked me what I was gonna be doing with my life, and I said I was gonna be an investment banker. And she looked at me and said, "Yeah, you? Get outta here." She told me that she was actually making money as a sculptor at the Franklin Mint, and didn't I always want to be a writer? And I said yeah, and she said, "Well they pay writers too," and did I have a resume? Of course I did. One thing led to another, and before I knew it I was hired on as a copywriter at the Franklin Mint. I had every intention of only doing it for a few months until I had enough money to buy a car, rent an apartment, move to New York, and become an investment banker. But of course that never happened. This was in 1976. This was the year of the Bicentennial. I might add, as soon as I signed on at the Franklin Mint, the metallic business went into the dumpster because it had been saturated by all the Bicentennial mailings. And the Franklin Mint did not come out of its funk for about three years. So those were interesting times to be there. CLAYTON: Wow. What else did you work on there? They still did a lot of metallics in the first couple of years I was there, and then they gradually transitioned into porcelain and other kinds of collectibles from there. By about 1981, I had been working as a copywriter at the Franklin Mint for as long as I wanted to, and I almost left. The last piece I wrote before I stopped being a copywriter there was something which I am still pretty proud of. It was for the Wyatt Earp gun replica; it was a non-firing replica of the gun that Wyatt Earp used in the shootout at the O.K. Corral. And I think that sucker was promoting until at least 2001. CLAYTON: That's great. I sold a bunch of rare coins and stuff like that back in the ’80s too. ARTHUR: Those were good times for that. CLAYTON: It was a fun business. The historic side of the product really grabbed people's attention and fantasy. How did you start out at Franklin? What did you think when you first arrived at the job and they told you what you'd be doing? I was underwhelmed. I started out writing the little pamphlets that come with the medals that you receive. The pamphlets try to keep up your interest in the collection that you've subscribed to. So I wrote a lot about American history and other things that were depicted on medals. Then they upgraded me to writing follow-on promotions for promotions that had already been written by other copywriters. That was fascinating training actually, because the Franklin Mint had a huge copywriting staff at that time — or at least to me it seemed like a huge copywriting staff — about 10-12 people. And my job as the juniorest of juniors — I was probably the youngest copywriter there by about 20 years — there was one guy that was 10 years older than me, but the rest were about 20 years older than me — and my job was, if they sold an etching, my job was to sell etchings two, three and four to the audience that bought etching number one. And that meant I had to write it in the same style as the guy who wrote the promotion for etching number one. So I learned how to study 11 different copywriters with very different styles, and I learned how to sound like them. And it turned out to be pretty good training, because you really had to take notice of the niceties of each man's style. CLAYTON: Had you had any sales experience at all before coming to Franklin Mint? CLAYTON: So that's pretty much your training. Absolutely. Back then, Franklin Mint ex-employees used to call Franklin Mint the P & G of high-ticket direct response. It was a terrific experience. At that time, Franklin Mint was an international corporation. When I came there, they had this international headquarters in London, and they folded that into the headquarters in Franklin Center. So there were people from all over the world — Japan, Germany, Australia, England, and France — all running around at the Franklin Mint. Apart from anything else, they were really fun people, and we had a really good time. But also, you just learned so many things about other marketing disciplines from elsewhere in the world. CLAYTON: Prior to coming to Franklin Mint, had you ever bought anything through the mail? Oh, yeah. If you want to ask what my single greatest influence as a copywriter is, it must be those ads in the backs of comic books in the ’50s. I loved those ads for sea monkeys and Uncle Miltie's Ant Farm. And if you take a look at that sea monkey's ad, it really holds up. It's a great ad, and it's so much fun. And there's stuff like the little alligators, and the real monkey that could fit into a teacup. And of course, Charles Atlas. Sure, absolutely. That's one of the early areas of direct response, and not many people actually talk about that. That's really cool. I hadn't thought about those ads in years. And I think they're still wonderful. They're a whole lot more fun than a lot of the ads that people mention — for example, "They laughed when I sat down at the piano." That's a wonderful ad, but it's not as much fun as the sea monkeys. So after a bunch of years at Franklin Mint, you became V.P. of two divisions there. Yes. I was about to quit because I was really tired of writing collectible copy. They put me in product development, and then the Franklin Mint got acquired in 1985. Up until then it had been a division of Warner, and Warner sold it to a couple that took it private. They promoted me to V.P. ; they fired a lot of other people. And they put me in charge of the female collectibles division, which at that point was the turkey division; it wasn't doing anything. And I increased their sales through a combination of dumb luck and some skill, and the fact that we had nowhere to go but up. I increased their sales by about 40% in one year. Then they fired the guy in charge of male collectibles. That's a funny story, by the way, because the guy they fired is now the CEO of QVC Network and still a really good friend of mine. But they fired that guy, and they hired another guy, and then they fired him, and then they put me in charge of male collectibles. And I always joke to Doug — the CEO of QVC — that I thought I was lucky not to get fired. But that was certainly the best career move Doug ever made. So how long did you stay on as V.P.? I left in 1988, and that was probably the only courageous business decision I ever made. You were making real good money, obviously. Yes, I was making very good money. When I quit, I thought I had a pretty lucrative contract lined up; and it turned out, about 10 days before my last day at the Mint, that deal fell through. And so at my going away party, I had absolutely no prospects whatsoever. CLAYTON: What made you decide to become a freelancer? Well, I had been at Franklin Mint for 12 years, and I really loved working with the creative people, not just the advertising creative people but also all the artists, and sculptors, and all those other kinds of crazy people who used to work there. But the further up I got in the organization, the more it just became going to meetings, and infighting, and dealing with personalities, and that just did not appeal to me at all. I wanted to do something more creative, so that's why I left. Actually, I might have gone onto another corporation if my freelance career hadn't taken off in a big way almost immediately, thanks to another couple of lucky coincidences of people calling me on the phone. After I left the Mint, my wife and I just took off in the car for two weeks and drove across the country. We went to all these places I'd always wanted to go to. We went to Wall Drug, Mount Rushmore, Yellowstone Park, Niagara Falls, and Cooperstown. And I came back, and there were three phone calls on my machine, and I never looked back. Great. Who was your first freelance package for? My first freelance package was actually back when I was at the Mint; that was in the early ’80s. A lot of copywriters do freelance jobs on the side, and I was no different. CLAYTON: (Laughter) Who later founded Boardroom and is today one of your best clients. I don't even think that Marty knows this, that I actually wrote the control for Commentary in the early ’80s. CLAYTON: Oh, that's great. You need to tell him that, he'd enjoy it. ARTHUR: Yeah, well I intend to, I've just never gotten around to it. So after you left Franklin, you immediately began freelancing. What kinds of companies were they? Were they in the newsletter industry, periodicals, books or what? Funny enough, the last thing I wanted to do when I went out on my own was to go into more collectibles, and of course that's what I wound up doing. A fellow named Jeff McKinnon, a really good man, was starting up a doll company, and he wanted help in product development. He offered me a pretty good piece of the action, and I had no other business, so who was I to say no to this? But I was determined not to be a copywriter; I wanted to be a product developer. So for about the next nine years I didn't really write that much copy. I started doing it because I love to write, and some people asked me, and it was an opportunity to make some quick cash. The product development business tends to have a much longer turnaround time before you actually see royalties. So in the late ’80s and early ’90s I did a little bit of copywriting — not a whole lot. I did some very upscale copywriting for a fellow who was selling a database to the trust departments at banks. I did some work for Meredith, including what is, I believe, still the control for Ladies' Home Journal, although it's been modified many times since. On one of these upscale financial jobs I ran into a very gifted designer named David Wise, who was to become an enormously good friend to me. He helped me incredibly in getting newsletter and magazine clients for my business, which is primarily what my business is now. CLAYTON: So did he connect you with people like Boardroom and Agora and so forth? Yes, he did, and it's the funniest thing. I got a call from him one day, and I guess by then we had done just a few jobs together — a couple of jobs for Meredith and maybe a job for Oxmoor House — mostly about women's stuff, cooking, and stuff like that. I got a call from him saying, "You do financial, don't you?" And I said, "Well, I guess." And he said, "Good. You'll be getting a call from somebody at Agora." And it was someone at Agora who wanted me to promote a newsletter for Doug Casey. And I had never written a magalog before; I didn't tell them that. But I had never written a magalog before, so I just kind of sat down and wrote for three weeks. And at the end of it, I gave it to Dave, and I said, "Do you think it'll work?" He said, "Yeah, I think it will." And I sent it to Agora, and the contact at Agora said, "Yeah, I think this is our next control." It was a health package for Agora, which also became a control. And so you might say that David Wise bamboozled me into becoming a successful financial and health copywriter. I've been out of this market for several years working exclusively with a single client — and I came back in, and all I heard was "Arthur this" and "Arthur that." So in the last few years, you've really taken the health and financial industries by storm. Yeah. (Laughter) Other than sea monkeys, what would you attribute that success to? First of all, I think it's because one strength I have is that I really truly enjoy writing. I love to write; I love the act of writing. I love writing a good sentence. In fact, it's a little bit of a fault of mine. I probably like writing an entertaining sentence better than I like selling the product. But 30 years of life in marketing and product development pretty much beat into me the need to sell a product. I think that I'm able to sell products in a more entertaining way than a lot of other people are. I think that being entertaining while you are selling is a big key to success in a very crowded marketplace these days, because you really have to buy people's attention. You can buy people's attention in several ways. One is that you can offer them a great benefit. The problem with offering great benefits these days is that there is so much stuff out there offering totally unbelievable benefits — especially on the Internet. And people have gotten burned too often. This had eroded the credibility of traditional benefit-oriented selling. So you really have to be not only benefit-oriented, but you have to be very entertaining. I think the second reason that I credit is the discipline that I learned when I was in academia. I joke to our friend John Finn that writing a magalog isn't all that different from writing a term paper. You take notes for two weeks, you write for two weeks, and at the end of it you've got a footnoted product. How many hours a day do you work, I mean actual writing? Actual writing, probably a maximum of about five hours. After that, my back gives out. And even if my back didn't give out, my brain would give out. I think probably about four to five hours is optimum for me. I find that it's really in hour four that you really start writing the good stuff, and in hour five you continue on that flight path. If you write much beyond that, you can get a little inebriated with your own facility and start writing stuff that really isn't that good, at least that's what I find. Is there a time of day that works best for you for writing? Yes, I'm definitely not a morning person. Being married and everything means that I can't keep the hours that I did when I was in school. When I was in school — I'm a very light sleeper, and so I used to do all my studying after about 8:00 or 9:00 when things would start to quiet down. And then I would actually go to sleep at about 5:00 in the morning. And everybody knows that on a college campus, things are pretty quiet between 5:00 in the morning and noon, which is perfect for sleeping. Then I'd wake up at noon and go to my classes, and that really agreed with me. Now I can't do that in business, so I work until about 7:00 in the evening. I get up, I work out for at least an hour, I have a nice long leisurely breakfast, and I try to read something uplifting while I'm having breakfast. And that's actually important for the writing, too, is to read good stuff before you start writing. I tend to read stuff that is either historically really interesting or that is beautifully written, and it's very often fiction. I do that, number one, because I don't want to be thinking about my work; I don't want to be thinking about advertising. I want the right half of my brain to be able to take a little rest from that, and I want to be able to soak up other kinds of writing that is not advertising, which is very important to me. From what you said, it's pretty easy to draw the conclusion that you're great at soaking up other writers' styles, picking up little phrases — maybe not the phrases themselves, but the mood in various types of writing, and your ability to emulate. Yes, I'm kind of an unconscious mimic that way. I think it's just part of my makeup that I'm a pretty good parakeet. And so I have to be careful sometimes about what I'm reading. And I often try to key what I'm reading to what I'm writing. For example, when I was writing my control for Dr. Douglass' Real Health [now The Douglass Report], he's got a very wry sense of humor, and I really wanted to get that into the promotion. His whole thing is that he's such a skeptic, and he takes real pleasure in being a skeptic. And I didn't want to make him sound like he was coming down hard on people or anything, so while I was writing that I was reading books by P.J. O'Rourke. CLAYTON: When you finish a draft, do you show it to other people besides clients? ARTHUR: Yes. My wife is a copywriter, and I very often will show her the draft just to get a gut check on it. If she is really taken with it, I know that at least I'm hitting the emotional chords. If she kind of goes, "Eh, it's okay," then I know that I've got to work on it a little harder. Does she work in a similar field or is she in another field? No, she works in a similar field. She does different kinds of writing than I do, but she works in a similar field, and we share some clients too, but she's got her jobs and I've got my jobs. CLAYTON: Yeah, my wife, Wendy, was the Director of Marketing at Phillips. ARTHUR: Oh, that must be very helpful. We launched Health & Healing together back in the ’90s. That's how we met. So she's a brutal critter. Yeah, well that's what you need, don't you? ARTHUR: Somebody who can be brutal, but somebody who you can also trust. CLAYTON: You know, if I don't like her dinner, I tell her that too. ARTHUR: (Laughter) That's a little more dangerous. CLAYTON: Yeah, so then later on she says, "You know, it just occurred to me that I get my feelings hurt when you're not crazy about dinner, and then I walk up to you and critique your copy for you." I can’t wait for the 2nd part of this interview! This installment was hugely entertaining and informative. I was charmed by the talk about Seamonkeys. I ordered ‘em myself, expecting the little guys to have crowns and tridents somehow. I’ve never heard of the “real monkey in a teacup” thing – I’m appalled by the idea of shipping primates to children in the mail… it just seems cruel because they are fragile creatures needing a lot of special care. 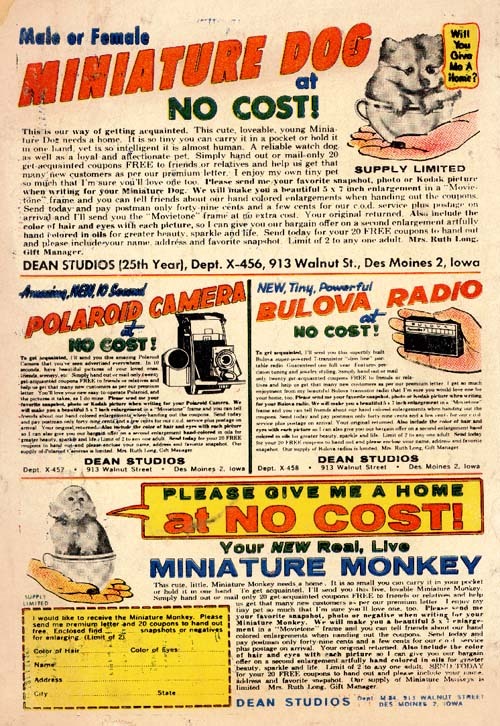 Don’t get me wrong – I desperately wanted a monkey myself at age 10, and I’ve asked around other have confessed to wanting to own moneys in childhood too. On the subject of making copy and the whole process of engagement entertaining, I agree 90% – because it’s a balancing act where it can be tempting to cross-over into clown territory or not be truly empathetic with your market. Some “pains” are just real serious things and while writing to sell should be clear and engaging, writing for a hemmorhoid cure (a painful problem) is very different from a course on making money online (which is a thing people buy because they want pleasure). The current crop of scruffy surfer-dude cut-ups teaching how to make money are a great example of how the line between entertainment and salesmanship is getting blurry with some markets. Consumers have a need to create a self-image around what they buy, which cultural trends they follow… and marketers who are able to tap into these powerful needs to, um… “belong” or “be somebody” can do pretty well working this entertainment-selling angle. A lot of adult problems however are not areas where customers are likely to be looking for a “personality” to entertain them – which isn’t an excuse to be boring with how you sell – it’s an opportunity for savvy marketers to “feel the pain” in their prospects and get under the skin of what people really want…. sometimes it IS excitement or entertainment or a scruffy hero to identify with, but not always. What a fun read – full of underlying lessons. From the time I was about 7 or 8, I’ve been so fascinated by the ads like used to be on the backs of comic books and inside match books. I long ago lost track of how many things I ordered from mail order as a result. I may have been the youngest customer Michigan Bulb Company had in their Flower of the Month Club. Which got me into gardening as a hobby. One of my favorite seed catalogs is put out by JL Hudson, Seedsman. The format is tiny type that nearly requires a magnifying glass to read – no pictures, just a few illustrations. But the copy is compelling, I’ve ordered hundreds of dollars of seeds from them over the years. And until recently, a pack of sees was only a buck! If I happen to be in a waiting room without something to read, I still (almost compulsively) pick up a magazine and turn to the ads. Once again, a very informative agenda. You guys are really doing well educating the general public. Loren, I would like to know how I can contact you. An email address will be just great. Clayton: Will you ever consider posting some of these wonderful interviews in Mp3 / audio formats? Tip: offer the interview in audio format. Many people have a hard time reading a screen on a computer. Nice article. Know what I’m working on? I take the bullet points mentioned at the top of the piece and track them to the article to find where they came from. Then I try to re-analyze the section and understand how the bullet point was developed. Very interesting and important thinking. Its something I’ve seen Clayton do many times, (as well as others,) and I’m wanting to develop this skill myself. (The Sea Monkey’s ad WAS amazing. It was the illustration that sold it and made it last so long. The comic book ad collection shows a bunch of similar ads that weren’t as successful or long-running, and you can see why. The picture sold it, (even though it wasn’t even remotely close to showing the reality of what were BRINE SHRIMP!) If I recall, later versions of that ad had a small, round photo of “actual sea monkeys.” Prolly because so many complained! Wow! What a fantastic conversation! I could see the whole thing and not having any real experience, I got a great sense of what you two guys do– You LOVE your work! Good for you. It was an inspiration and now I am on to part II! Thanks!